Nearly 100 years after the American archaeologist, Hiram Bingham, set his foot here, I took my time to look around in the "last refuge of the Incas". Machu Picchu in Peru got this name because the Spanish conquers never find the village high up in the mountains. Early in the morning the clouds lifted and the big wonder of a stone city became visible. By looking deeper in to the details in the Inca ruins, there is obvious that many things here are well connected with the jungle. Peru is often referred as "the land of the Incas". One proof of this is Machu Picchu. Hiram Bingham is known as the person who made Machu Picchu famous. Just like him, I started from Cusco, 120 kilometres away from the mysterious Inca city. Instead of walking through the Urabamba Valley as Bingham, I took the train up the El Valle Sagrago, the Sacred Valley. The Machu Picchu, also called the Lost City and Sacred city, is located at height of 2,350 metres above sea level, also lower than the Inca capital Cusco (3,400 metres). Machu Picchu, off beaten tracks in Amazon, exotic tribes and secret ancient wonders! For they who walk the Inca trail, they will reach heights up to 4,200 metres. The highest peaks in the area rose over 6,000 metres and they are covered by snow. On the trail you can experience Inca architecture and beautiful nature in perfect harmony. Examples of this are the symbolic shapes of animals, naturally evolved or made by hand of the Incas. It's believed that up to 1500 people lived in the city. When Bingham stumbled upon the site it was overgrown with vegetation, and it looked very different from the one we see today. Now the site is cleared and the ruins are become more visible. To protect this wonder it has been put on the UNESCO list over World Heritage sites. Photo. Machu Picchu is bathing in clouds. Each morning the clouds cover of the peaks of the Ancient and Young Picchu - Machu and Huayna. The humidity and heat of the water returns back to the Amazon jungle. Machu Picchu means "old peak". No one knows the original name of Machu Piccu. It's also still a mystery when, why and how Machu Picchu became built. Several theories have been launched. Another question is why the Incas built the city so high up in the Andes Mountains? What is really Machu Picchu? Is the city a citadel (a military fortress)? Refuge of the Incas (last hiding place for the Incas to escape from Spanish conquers or other enemies)? A ceremonial place (for strange rituals and sacrificing to their gods)? Actual have the Incas had no religion, but they was very spiritual inspired)? A big farm for growing crops and plants (terraced fields for agriculture to subsidence the inhabitants)? Factory for producing Coca (Coca leaves, used for increasing the Incas runners' endurance for bringing messages from one place to another)? Protecting from diseases on a remote and isolated place? Or could it be built for other purposes? Seen from a broader view Machu Picchu could had a multifunctional purpose, so maybe most question could be answered with YES! But according to experts there are no traces for that Machu Picchu has been a designed for military purposes. Machu Piccu is a big building complex, which contain temples, sacral palaces, holy observatories, strange alters and symbolic stones. Here, high up in the clouds, did the Incas conduct holy rituals. Some stones are designed for symbolic reasons, for example shaped as animals. Other stones are for dwelling and ceremonies. Some of the stones are weighting many tons. It's not possible to get a razor blade between the stone blocks. 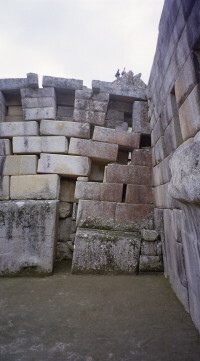 One of the most characteristic with how the Incas shaped the stones is with many edges. There are stones with 12 edges (angels). One place near Machu Picchu it has found a stone with totally 40 edges. It was important for the Incas to build solid so the building could stand earthquakes, but they didn't use a single spoon of cement. I assume that the Incas had a deep thought about building the city so high up in the mountains. So when the Incas realized how special this place is, they started the building of the city itself. They organised a big project where they joined resources from different skills as architects, constructors, stoneworkers, astronomers and priests. The trinity was fundamental for the Incas: fire, water and earth. Finally they manage to apply the natural elements into a magnificent whole. The first thing to do was clearing away the tropical rainforest. The steep terraces around the city prove the difficulty of building the complex. The shape of the whole place where the city is built is also special: the form of a huge condor, flying up to visit the Milky Way, the Way of all Beginning. After being in the Amazon jungle for a week in July 2003 searching for the puma, it was amazing to see that the also the Incas had been fascinated of the puma. Animals always played an important role in the myths of the Incas, especially the Snake, the Puma and the Condor. They represent the underworld, the world of men and the upper world. These animals are wonderfully processed in and around the Sacred City. When the Incas choose to establish them here, it was definitely made on purpose. Photo. The Huayna Picchu (2700 meter over sea level) has the natural shape of a Puma. The architects built small high terraces on the summit to give the impression that the hair of the puma stands up straight. The eyes are cut out; the mouth and the form of the head have a natural origin. The drawing seen from teh right view, shows clearly that the Puma is guarding the Sacred City. The Incas also shaped the Inca capital Cuzco as a Puma, with the huge stone complex Sacsayhuaman as the head. 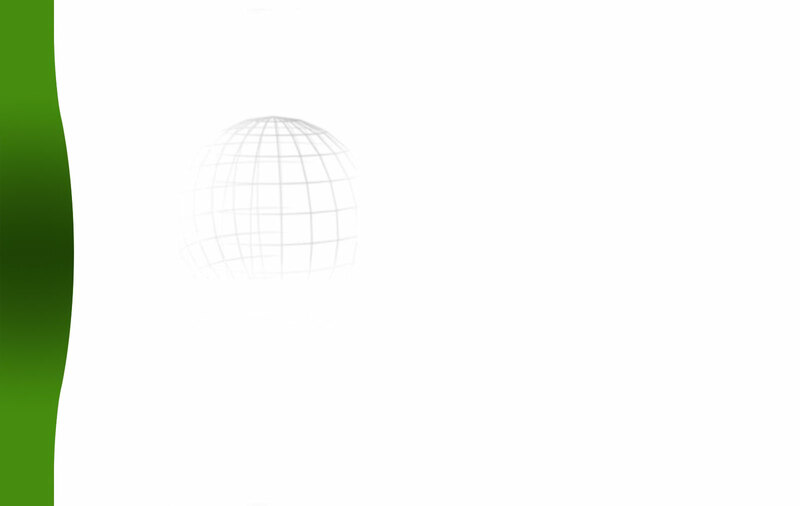 How could they manage to see the whole picture in a so big scale? The white line points to a young bird stretching its wings. It's amazing that Huayna Picchu means "Young Mountain" in Quechua and Huayna Picchu "Young Bird". Based on this, it must be obvious that the Incas didn't choose this place by coincidence. They planned the building of their most beautiful sanctuary according to the natural elements surrounding the place and the ideology of their cosmic vision. Perhaps the Incas had a secret wisdom about nature, construction, astronomy and more that no one in the modern world knew about today? Photo. Llama resting at Machu Picchu. Did the Inca know about DNA? Has the "wild camel" been developed through 3000 years or it is created by the lncas. The so called "wild camel" is a hybrid, a crossing of Alpaca and Lama. The alpaca and llama can interbreed sometimes and it's sometimes difficult to see the difference between them. Did the Incas also create own plants for subsistence? Photo. Winay Wayna, with typical Inca architecture and with 19 baths, which are located beyond the houses. Agricultural activities took place here. The Inca had real good knowledge about the sun and the moon. They know when to saw and harvest, so they could stay alive in such harsh environments. Researchers mean today that the city was lost in the end of the 1400 century, also 30 years before the Spanish Conquistadors invaded Peru. At the time the Spanish emerged, it was a civil war in the Inca kingdom. No one knows why the Incas moved from the city and where they went. This would probably be an unsolved mystery, but one thing stands clear for me: the Incas had good knowledge about the Amazon jungle and used its resources as food, drink, medicine and for inspiration from the animals. More than half of the Peru's land area lies in the Amazon basin, where the rivers often where the only ways to transport. I was highly amazed and intrigue of the exotic plants and animals. It must be a naturalist's paradise. So the jungle was for the Incas, I believe. It was obvious an valuable source for life just as the sun. As more we experience the jungle, we will understand how useful it is. Peru currently has roughly 5 percent of its territory protected by a system of around 50 national parks, reserves, sanctuaries and other designated areas, a process which has developed extremely well since it was begun in the 1960s. I hope this work also will be successful in the future so the country can save its natural resources. Stein Morten Lund, 28 July 2002. I found a big treasure in Peru! When I decided to go to Peru, I looked forward to explore lost cities from the past and bushwhacking in the untouched rainforest. I dreamed about finding big gold treasures so that I could finance my holiday tour. I didn't find any big gold treasure, but I found something bigger, the heart of the Peruvian people. With their charm, kindness and hospitality, they melted my heart. These memories will burn as an internal flame in my heart forever. Siempre Peru! Viva Peru! For useful background information about the Amazon, I recommend the book "Your field guide to Manu - nature's paradise" by Arto Ovaska. It's about the history, rainforest, animals, tribes, precautions and tips. Especially thanks to Ruby Huanca for providing useful information to this and other articles about Amazon. Photo. Ruby, an excellent guide from Peru. As more people visit the jungle in Amazon and learn about its flora and fauna, more people will become involved in the work for conservation. Local people and governments will also see that the long term value of the rainforest may be worth more if the rainforest remains intact. Peru currently has roughly 5 percent of its territory protected by a system of around 50 national parks, reserves, sanctuaries and other designated areas, a process which has developed extremely well since it was begun in the 1960s. · Formal country name: Republic of Peru. · Area: 1.28 million sq km. · Language: Aymara, Quechua, Spanish; Castilian. · Religion: Over 90% Roman Catholic, small Protestant population. · Explore the lost city of Machu Picchu. · Study the enigma of the Nazca Lines. What is really the purpose of these lines? · Experience the country`s beautiful scenery, the Peruvian Andes. · Visit home to some of the millions of highland Indians who still speak the ancient tongue of Quechua and maintain a traditional way of life. · Get an adventure of life in the Amazon Basin, which occupies half of Peru. Look up for the puma! Photo. Rock figure in the shape of a condor head and neck. My guide also indicated that the whole city could have been shaped as a condor. The main part of the city is the body, and other constructions form a neck and a beak up against the back on the opposite side. Photo. Palace or temple called The Three Windows. © Travel Explorations. Machu Picchu shows a variety of shapes of granite stone. Photo. One of many solid walls in Machu Piccu. The most amazing about the stones are that they fit so well together. How the Incas made it is still a great mystery because they had no tools of steel. Photo. Ruins of the main temple. Built with three walls. The altar is in the middle in the front of the central wall. © Travel Explorations. The earthquakes have moved the stones. There are legends about a liquid from the nature that soften the stone, so the Incas could shape them as they wished. As far I know there has not been find traces that document this, but the legends still live. No one has come up with a reasonable explanation how the Incas shaped the stones. Photo. Machu Picchu - a wonder of world, perfect built in a beautiful landscape. Photo. A beautiful garden in the middle of the city. Nothing here indicates that Machu Picchu has been a fortress in the past. 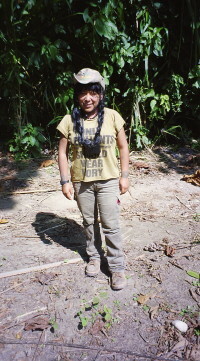 Get in contact with local Indians and explore lost wonders in the jungle - Peru! The tour operator Coex Amazon (website: Coex Amazon) in Lima, Peru, offers 5 exceedingly different and uniquely exciting adventure expeditions in the mega diverse and authentic Peru. All of them are roundtrips completely off the beaten tourist tracks. These are Maranon Valley, Urubamba, Pacaya and Ucayali. 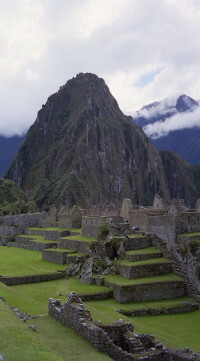 The tour operator organise also tours to Machu Picchu. You will have the opportunity to get close to wild and mighty nature and fascinating people with little western influence. At the same time you will experience some of the most important historic and archaeological sites on the American continent. 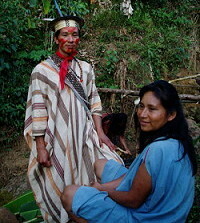 Coex Amazon offers especially trekking in the Maranon valley to the lost but very idyllic mountain town of Chachapoyas. Here you can admire one of Peru’s biggest ancient wonders, the 2000 year old town fortress of Kuelap. On the way you will get in touch with Indians living in their traditional way. This tour is for genuine adventurers who want to experience something special. Are you ready for the off beaten tracks in Peru?